There is a chasm between customer expectation and product delivery. In marketing, everything you do creates an expectation. Your proposition is a promise. Customers can only be confident that you deliver on your promise once they cross that chasm and make a purchase. What they discover has huge implications on customers’ satisfaction — and, therefore, your brand and business performance. 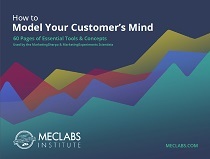 View this week’s chart to see data showing the effect of setting the right expectations with customers — data that you can use to win arguments in any meeting when you sense your marketing department, campaigns and clients are going awry. How well do the products/services of [company name] do their intended job? It creates an expectation — and it is marketing’s job to set customer expectations accurately. Seinfeld highlights the importance of customer-first marketing. Yes, consumers are a skeptical bunch. However, when they believe a product does its intended job, there is a huge benefit. As you can see in the chart above, 91% of satisfied customers said the product did its intended job well or very well — and there are huge benefits from having satisfied customers, as you might expect, like customer loyalty. On the flip side, 41% of unsatisfied customers said the product did its intended job poorly or very poorly. But it takes much more to create a satisfied customer than to lose one. 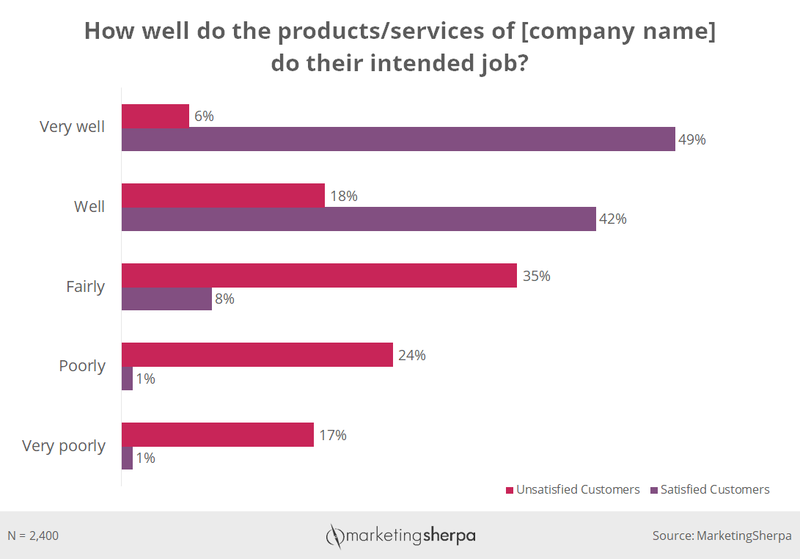 The most popular response of satisfied customers (49%) was that the product did its intended job very well. However, the most popular response from unsatisfied customers (35%) was that it did its job fairly. In other words, to have a satisfied customer, you most frequently need a five out of five match between expectations set by marketing and true value delivered by the product (a.k.a being rated "very well"). But you can lose customers most frequently by even having a three out of five fit between expectations set by marketing and true value delivered by the product (a.k.a being rated "fairly"). Seinfeld tells us that we know the product is going to stink — and conventional wisdom would agree. If you point this out to people, many would likely say they are skeptical of an advertising promise. However, if that were actually true, would they be alienated so easily? Doesn’t it seem like they still expect a good product when marketing promises them one? “[The fact] that so many people perceive the same product differently means there's a problem with the marketing — not necessarily the product. I often see this when I'm navigating the endless options on Amazon. The same product typically has both five-star and one-star reviews. And many of those one-star reviews don't say nearly as much about the product as they do about the consumer’s expectations,” Kevin Knight, CMO, Experticity, told me. “One of the root causes in this disconnect between marketer and consumer — between expectation and need — is short-sightedness. Some marketers fixate too much on near-term metrics (like clickthrough rates, conversion rates and even sales) without taking into consideration long-term effects on brand perception and loyalty. No product is perfect. No service is truly everything to everyone. Find out what your product does best for customers and accentuate the positive. Because, keep in mind, you don’t need to promise the world to every possible customer to be effective. You need to find your ideal customers and explain how they will benefit. And, if the right fit isn’t there, create a product and brand that delivers what customers want. For example, 365 by Whole Foods Market is the organic grocer’s value-concept store. This is a great example of customer-first marketing and a customer-first business. Whole Foods took a chance in “competing with itself” by launching a new brand that would better serve a specific segment of customers — younger customers and those who are more price sensitive. “There’s a lot riding on properly setting consumer expectations. With more choices than ever before, it's a buyer’s market. A consumer who feels let down by a brand can generally find ample competitors ready to meet their current — and future — needs,” Knight concluded.